The first step in planning for new kitchen cabinets is taking measurements to see what space you have. You will need a tape measure, pencil, blank paper or our planning grid. Click here for grid. Accurate measurements is a critical part for a successful kitchen remodel. 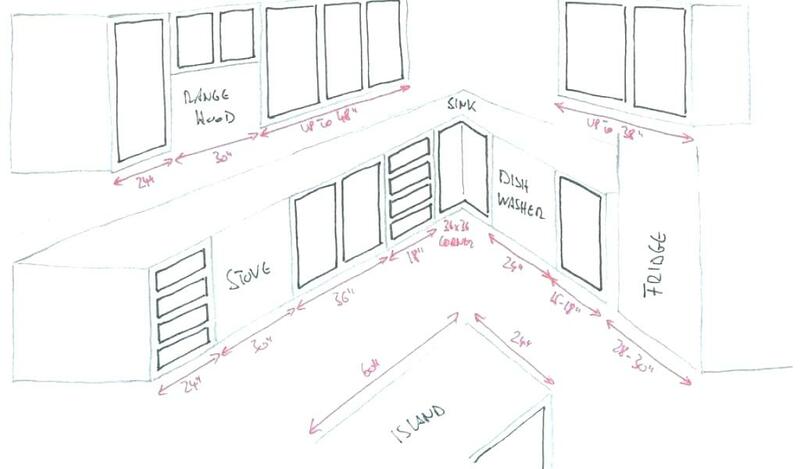 The first step in measuring is to sketch out the shape of your room. Begin with the walls of the room and number each wall: Wall 1, Wall 2, etc. Measure the height of the walls and then corner to corner working clockwise around the room. Add in doors, if any. Measure Windows and appliances. Measure from the wall edge to the window(s), size of the window and then the remaining space to the next wall. Add in the appliances including the width and height. Add in the sink measurements; mark where electrical outlets are and also add in any oven vents. Now measure the existing cabinets that are being replaced and add those to the sketch. Start with the lower cabinets and then add in the upper cabinets. Lower cabinets, called base cabinets, are normally 36 inches high and 24 inches depth. The width can be many sizes. Standard widths are 9, 12, 15, 18, 21, 24, 27, 30, 33 and 36 inches. Upper cabinets are normally 18 inches above the countertop and can range from 30 to 42 inches tall. The depth of upper cabinets are 12 or 15 inches. After receiving your measurements we can put together a design and estimate for the cost of your new cabinets. After the approval process, we will provide a final on-site measurement to double check all the numbers.